Kyrie Irving has officially been ruled out for tonight's game versus the New York Knicks with a right quad contusion. It is believed that Kyrie sustained the injury in Monday night's tilt against the Denver Nuggets. This will be Kyrie's fourth missed game of the season. In his first three absences, the Boston Celtics struggled to score and finished with a record of 1-2. Celtics say Kyrie Irving will miss tonight's game against the Knicks with a right quad contusion. The last game that the Cs played without Kyrie was probably their worst game of the entire season. The team struggled to find a consistent scorer, and ended up turning the ball over 19 times in the contest. Their highest scorers on the night were Al Horford and Marcus Morris, who tallied 14 points each, and their most efficient shooter was Marcus Smart, who hit 6-of-11 from the feild, 54.5%: a sure sign that it was an off-game. The Celtics took the loss, 98-90. Kyrie isn't the only player who will miss tonight's game, and heads a list of point guards who will be unavailable. Marcus Smart is still out because of a right hand laceration that came as the result of unknown frustrations, and Shane Larkin will be a game-time decision because of soreness in his right knee. With two of the Celtics' four point guards officially ruled out, and the other questionable to play, third year guard Terry Rozier will get himself the start; the first of his career. Terry Rozier will earn his first NBA start tonight in place of Kyrie. Shane Larkin (right knee soreness) is a game-time decision. 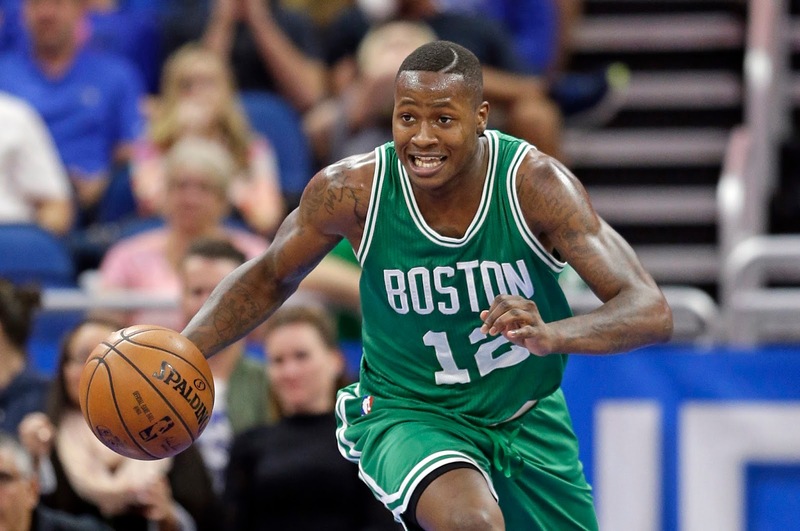 With Kyrie Irving (quad) and Marcus Smart (hand) out, Terry Rozier draws his first career start. How did Brad Stevens deliver the news? Terry was questionable for the Celtics' last game versus the Nuggets, but ended up playing thirty-whopping-minutes. He finished with 8 points, 9 rebounds, and six assists. Those rebounds were the most from any Cs' player in the game, and only trailed Nikola Jokić for most on the night. The Celtics ended up winning the game by one point, 111-110. Tipoff for Celtics vs Knicks is in less than an hour! Let's go Cs!